I've been thinking the past few weeks that I could start two new blog's sections, one dedicated the amount of books I was reading and other to share with you my dreams about how I imagine the future of my favorite applications, and how these application could be affected by the age of context. Another candidate is airbnb, one of my favorite internet services. I'm using these days the application because we're planning a visit to Berlin on april. Both mobile and web solutions are great products, so will be difficult to identify "nice-to-have" ideas. 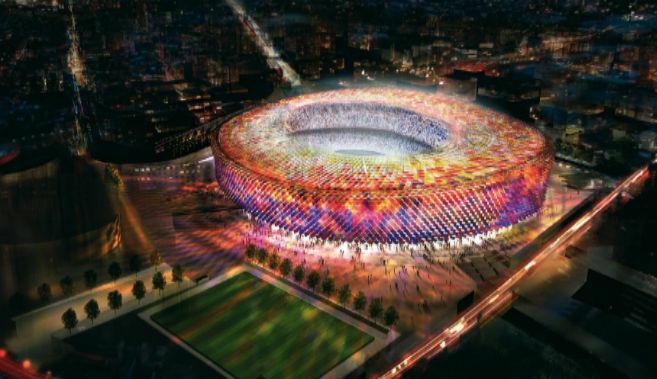 But the news of the last days, according to the future of the FC Barcelona stadium, related to one of my favorite parts of the Age Of Content book, the chapter about the NFL context "revolution" is the winner. So, I'll start with that. I listened some rumors about a huge project to improve the wifi of the stadium, I'm pretty sure they took a look to the New England (NFL) strategy and how the Patriots are working to contextualize the fans experience. Before a match, or before the season, the user should be able to bring a scheduling capability to the fans, maybe the professional soccer league (LFP) should evaluate other professional sports associations and try to professionalize their behavior. The current weekly scheduling is disappointing. If they improve the scheduling method, the fans could decide which season's matches they'd like to attend. And identify opportunities to purchase combined tickets (bascketball / handball + soccer with 10%) And of course buy (or rent) merchandising of their favorite players. The application must provide a mobile payment feature, allowing to the visitors select the preferred seats based on the availability of the stadium. Ideally for the club could be great be able to developed some loyalty programs (up-selling / cross-selling) and drive some fans for the non-soccer events. Also to improve the management of the empty seats on the stadium, with a real-time interaction tool inviting entity partners that will not use their seats during the match to relese them. As we will describe on the "during the match" section, the club could develop some premium, and exclusive services for some fans. Food&drinks on-your-seat delivery, premium parking, exclusive magazine of the match, pictures with the players after the match and so on. The day of the match is important helping fans to arrive at time to the stadium, to bring them an easy a great experience. So, let's provide them relevant information to drive them to the stadium using the best way. Barcelona is one of the pioneer cities adopting "smart cities" technology, so we would integrate our services with the City systems to provide information about the public transport loading status, and about the road / street status to save them to stay stuck in the trafic. Of course we could also bring the public parking status information to our visitors, from the city systems, also integrating the stadium's parking places status. Finally, we could also provide to private parkings around the stadium an advertising platform to share their free places status, allowing to the people to arrive to the parkings with availability. Of course this platform could define some comission policy based on CPM, CPC or CPL/CPA policies. The system should be smart enough to balance the trafic to the diferent resources dynamically. When the fans arrive to the bus/subway stop, or when they are already parked, we should help them to know the best way to arrive to the stadium and the best door based on the bought tickets (stadium seats) and, of course, based on the loading status of the stadium doors. Finally, the mobile could be the new ticket to personal-access to the stadium, if we provide to the doors to the required infraestructure (NFC, BLE) to identify the users and their bought tickets just using the smartphone. Maybe this part of the fan journey is the most developed by Robert on the book "The Age of Context", based on the New England Patriots experience. And, why not? they could also install sensors to dispose real-time overloading status of these POI's. To be able to provide them a way to decide the best time to bring their foods&drinks. Also based on Robert's book, the best moments of the match will be available on the mobile application, giving the opportunity to select the best point of view for each situation. Exclusive HD videos just available for the fans on the stadium. Often the fans enjoy listening the match through the radio, the club could bring to the people a way to listen the match directly from the sport journalist working at the stadium. And capture information about the favorite broadcasting station for the club fans. Of course, the club could bring to the users real time insights, simulating when they are following the match on the TV, warnings, goals, kilometers, exclusions, changes, possession. This information is a great example of the insights that we could integrate in our point of view through the smart glasses. Or synchronize the referee stopwatch with the smart watch of the user. For the clubs is important to generate event's difusion, to promote matches' content, one way is inviting stadium fans to share their experience easily. The club could define a gamification (D6 strategy) to promote the social engagement, maybe we could include elements/componentes like a ranking, or rewarding the best journalist of the match (how many messages shared, how many retweets...) and give them a gift, a free-promotional access to the next match, etc. The match is also an opportunity to meet new people, just for fun, maybe the match is a "dating" opportunity. Maybe the loyalty application could provide to the users a way to interact between others during the match and promote the fun between them. But they could also provide a restaurant/bar marketplace for the places around the stadium, often the fans look for a place for lunch/dinner afther the match, is one example of the external economy generated by the event ... So, why the club could not offer a marketplace (like for the parkings)? And advertising platform with comission policy (CPM, CPC or CPL) to drive people to the places allowing them to book places using the club loyalty application? The end of the match could be also a good time to generate up-selling / cross-selling activities, we could send invitations for the next match or promotions to buy merchandising ... like last-call messages. All the purchase funnels must be analyzed accurately, maybe after a good match we detect a best selling behavior. The more time I dedicated to this post, more new ideas I had about lots of opportunities of the context solutions for the clubs and for the professional league associations. Lets see what the future bring to us.